The December 19 announcement of the winning university bid to create a high-tech campus in New York was stunning. It was preceded by mystery and secrecy. When he was elected, Mayor Bloomberg was expected by many to be a leader in bringing technology to New York City. In 2011, in his third term, he has fulfilled this expectation. Part of his plan was an RFP for universities to bid on using city land to build a high-tech campus. In May the Mayor also provided a roadmap for NYC to become "the leading digital city". The Mayor offered $100 million of NYC money toward university use of underutilized NYC land along with the land itself. The three main candidate sites were Governor's Island, the Brooklyn Navy Yard and Roosevelt Island. The campus was conceived of as the "Stanford of the East", and the smart money was on Stanford winning the RFP. After all, Silicon Valley has long been #1 in venture capital investments in technology, evidence of its long expertise in spinning off high-tech companies from centers of excellence in a university environment. MIT was also seen as a possible candidate. The Route 128 area in Boston followed the same track as Stanford and was widely viewed as #2 in tech spinoffs. An MIT professor visiting New York City 15 years ago told me that New York City would never catch up to Boston in the tech VC arena because New York City "doesn't have the entrepreneurial spirit". Well, guess what. The first surprise of 2011 was that the VC people were reporting that tech investments in NYC were exceeding tech investments in Boston. New York was now #2 only to the Bay Area. For whatever reason, MIT did not submit a bid. Stanford seemed to be putting a huge amount effort into its proposal, but then it suddenly withdrew. Was this a sign that the project was just too ambitious? Or was too tied to real estate? Was this exciting idea going to be still-born? Cornell, with its existing nexus to New York City (the Cornell-Weill Medical Center, the Cornell Club, the Cornell Institute for Labor Relations), was expected to join Stanford. But Cornell had its own idea and reached out to The Technion-Israel Institute of Technology in a series of secret meetings. Technion had the experience with spinning off companies that Cornell lacked. Politicking meanwhile continued over the various sites. Roosevelt Island is in Rep. Carolyn Maloney's district and on October 19 she held a press conference to argue the case for this being the best site. On December 14 she announced that her campaign and petition drive had convinced the US Postal Service to take Roosevelt Island off the list of post offices to be shuttered. So for the time being a post office on Roosevelt Island was guaranteed. 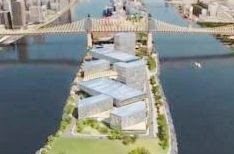 Just as well, since four days later, on December 19, the Mayor revealed ahead of schedule that Cornell and Technion won the competition with a plan for building a facility on Roosevelt Island with 2 million square feet of space, costing $2 billion. The plan was given credibility by the announcement of the $350 million gift on top of the $100 million promised by the City of New York for infrastructure improvements and $300 million worth of land. The $350 million gift is the largest Cornell has ever received. With $750 million in hand, $2 billion doesn't seem so far away. The visionary Cornell donor was later identified as The Atlantic Philanthropies, founded and funded by Charles F. Feeney. The Mayor must have been impressed not only by the degree of Cornell support but by the Cornell-Technion commitment to green architecture in the zero-pollution buildings themselves and in the planned academic staffing. It will also include major expertise in computer science (a given), energy efficiency and public health. New Yorkers were ecstatic. BetaBeat ("The Lowdown on High-Tech") produced a slide show of "14 Terrifically Scientific Signs" that 2011 is "the year for New York Tech". One sign was the bypassing of Boston. Another was the materialization of the tech campus. BetaBeat was being funny, but New York City may indeed soon be #1 in tech. Density is destiny and the aggregation of tech consumers and producers in NYC is going to be hard to beat when teamed up with a nerve center for high-tech research, education, innovation and financing. I have no inside information about why Stanford pulled out, but word of a $350 million gift by an alumnus to Cornell to support its bid for the tech campus may have prompted some serious questions to and by Stanford about the degree to which it could match this degree of commitment. The gift was a preemptive strike, about which much more will be written by people interested in the history and strategy of the relationship between cities and scientific knowledge and the commercial exploitation of this knowledge. This is a breakthrough not just for New York City but for the United States. As manufacturing jobs have flowed overseas, the United States must generate new kinds of jobs - well-paid jobs. High-tech startups offer the potential for creating such jobs. University campuses that concentrate technical and business talent and provide incentives for forming startups have been proven job-generators. I've been following this subject since 1973 when I wrote a report on "The Wealth of Cities" for the Council on Municipal Performance. From 1992 to 2006 I served three New York City Comptrollers as their Chief Economist and I worked on a report called "The NYC Software/IT Industry: How NYC Can Compete More Effectively in Information Technology" (April 1999). It shows how jobs in Information Technology in New York City grew 15 percent a year during the second half of the 1990s. I handed a copy to Deputy Mayor Dan Doctoroff early on in Mayor Bloomberg's first term. Here is a summary with links to the report. CUNY Chancellor Matthew Goldstein said he liked it. I think it still makes good reading in the context of the new Cornell-Technion campus. See if you agree. Payroll jobs grew by 103,000 in September, but a big portion of this is 45,000 Verizon strikers returning to work. Better news is the upward revision in payrolls for July and August of 99,000 jobs. Private payroll jobs grew by 137,000 in September, offset by a 34,000-job decline in government employment, entirely accounted for by 35,000 cuts by local-governments. What’s going to happen to government jobs when the deficit-reduction Supercommittee reports next month and recommends significant new cuts in federal spending? Remember, Congress is supposed to vote up down as with the base-closing commission. The household survey from the BLS does not give much relief from this bleak picture. The U.S. unemployment rate (U3) was stuck again at 9.1 percent, but if we add the percentage of the labor force that is underemployed – i.e., involuntarily employed part-time – this measure of unemployment rose by 0.3 of a percentage point, i.e., from 14.8 percent to 15.1 percent. This unofficial number strikes me as useful. We could call it U7. See the last line of the table below. The problem with the official BLS broad measures of unemployment (U4, U5, U6) shown below is that monthly changes in these numbers may be misleading because they include components that are not seasonally adjusted. The slight improvement in the rate of the marginally attached (U5), which includes discouraged (U4), could reflect seasonal factors. The unemployment + underemployment number (what I call U7) can be compared on a monthly basis because both components are seasonally adjusted. *Not seasonally adjusted. Marginally attached includes discouraged workers. Denominator in all cases but the LT unemployed is the labor force or (for U4, U5 and U6) a combination of the labor force and the portion of the marginally attached in the numerator. The U4 rate changes because of rounding. The other numbers shown are seasonally adjusted by the Bureau of Labor Statistics. Source: www.bls.gov/news.release/pdf/empsit.pdf. The official broad unemployment and underemployment rates (U4, U5, U6) are discussed at http://www.bls.gov/fls/flscomparelf/unemployment.htm#table1_2. The latest county job and wage numbers suggest that one place economic recovery starts is in counties that were already quite well off, like Manhattan. They also suggest that Santa Clara county, Calif. – the heart of Silicon Valley – is Manhattan’s main competitor. In the first quarter of this year, Manhattan, aka New York County, gained nearly twice as many jobs (43,400) as Cook County, Ill. (22,900), which includes the City of Chicago. The two counties have approximately the same employment base - Manhattan has 2.304 million workers and Cook County has 2.334 million. The first-quarter numbers, just published by the Bureau of Labor Statistics, compare the first quarter of 2011 with the first quarter of 2010 to minimize issues of seasonality. Among the 322 large counties with more than 75,000 employees, only Harris, Tex., gained more jobs than Manhattan in the first quarter compared with the same quarter in the previous year. Manhattan’s average weekly wage was the highest of the large counties at $2,634, with the next two highest-wage counties both in the NYC metro area (Fairfield, Conn. and Somerset, N.J.) The next two highest-wage counties are in California (Santa Clara and San Francisco). The average weekly wage in large counties in the first quarter of 2011 was $935. The increase in wages from 2010 to 2011 (again, first quarter numbers) was highest in Manhattan among the large counties, $222. The average U.S. large-county increase was $46. Santa Clara county was second. Somerset, NJ and Fairfield, Conn. are also among the top ten large counties in terms of their wage increase. On a percentage basis, Manhattan wages rose 9.2 percent, which placed 10th out of the 322 large counties. Manhattan accounts for approximately three-quarters of the New York City economy. Sept. 16, 2011—I'm reading about the arrest in London of Kweku Adoboli of the Swiss investment bank UBS at the Randolph Hotel in Oxford, overlooking Balliol College. Alice and I are here for the Oxford University Reunion Weekend—it's 49 years since I matriculated. Mr. Adoboli, the young UBS trader, made a $2 billion mistake, it seems. Using his Delta One trading system, he bought Swiss francs as a hedge when he meant to sell them. Before he realized his mistake, if we can believe this, the market ran away with his bet. Swiss francs fell in value. UBS took the hit for a couple billion. This exceeds Nick Leeson's $1.3 billion loss, which brought down Barings in 1995. It ranks third after Jerome Kerviel's $6 billion loss at Société Générale in 2008 and Yasuo Hamanaka's $2.6 billion loss at Sumitomo in 1996. All this from today's Independent, delivered to my door this morning. For UBS, the timing is bad. It had just started to show a profit in 2010. So long as no one bails out UBS, the victims are (and should be, based on the published information so far) UBS employees and shareholders. But for the just-issued Vickers Report, from Britain's Independent Commission on Banking chaired by Sir John Vickers, the timing couldn't have been better. It shows how risky the "casino" banks are, and how frail is their ability to control it. The Vickers Report recommends reversing some of Britain's "Big Bang" deregulation of 1986 by "ringfencing" retail (commercial) banks with a separate board of directors and shareholder equity that is at least 10 percent of risk-weighted assets. The plan is for new controls to be in place by 2019. A key element of the Vickers recommendations is that commercial banking and investment banking be separated. This was a central component of the Glass-Steagall Act of 1933, separating commercial banking from investment ("casino") banking. Commentators speak loosely about going back to Glass-Steagall. But the Glass-Steagall Act was introduced to deal with a problem that no longer exists: the distribution of fraudulent securities to uninformed customers. It was abolished because customers wanted the services universal banks can provide. 1. Glass-Steagall was not abolished. The Steagall part, having to do with deposit insurance and insured-bank regulation, is still very much in force. What was eaten away over time was the fence around the banks and the FDIC's ability to contain the problem. 2. Distribution of fraudulent securities to uninformed customers is still a problem. Does anyone believe that the underfunded securities regulators will prevent any future Bernie Madoff from emerging, or any future misdescribed and toxic derivative? 3. Glass-Steagall was designed to prevent runs on banks. The three-part program of the Banking (Glass-Steagall) Act of 1933 was to keep the foxes of speculative banking (the "casino" bankers) out of the chicken-coop of commercial banking, to empower the Federal Depsoit Insurance Corporation to insure deposits, and to regulate insured banks on behalf of depositors and the federal insurance fund. It also keep insurance companies out and also created the Federal Open Market Committee, which still sets U.S. monetary policy. It has worked well, and for 75 years the FDIC took care of ailing commercial banks without massive external funding. 4. "Customers" did not demand the erosion of Glass-Steagall. The legislative record of U.S. bank deregulation and subsequent actions of investment banks shows the ending of many Glass-Steagall protections was driven by financial speculators seeking access to the deep pockets of commercial banks and (via credit default swaps) insurance companies. There was no customer-driven yearning for "universal banking". As the Economist said in 1999, the erosion of Glass-Steagall protections should have been accompanied by new regulations for investment banks. The United States Government unwittingly became a guarantor of "casino" bankers - and insurance companies - without the limitations that came in 1933 with deposit insurance. The failure of Lehman Brothers three years ago showed how perilously far into the commercial banking business investment banks had penetrated. The latest UBS fiasco shows the urgency of preventing a repeat of that situation, starting with implementation of Dodd-Frank. What are the real choices before Washington this fall? 1. Don't Depend on an Out-of-Ammo Fed. Federal Reserve Chairman Bernanke wants to appear to be doing everything he can. However, there is little more the Fed/FOMC can do to help the economy since December 16, 2008 when the Federal Funds rate was lowered to the Zero Bound. Quantitative Easing hasn't made much difference. How much can the Fed spend buying long-term Treasury bonds to lower long-term interest rates, even if it sells short-term Treasurys at the same time? How much difference does it make for the Fed to buy up long-term bonds if the Treasury is selling new ones at the next window? 2. Implement Dodd-Frank to Help Address the Liquidity Trap. The economy would turn around if the Fed's easy-money policies led to more bank lending. But bankers are still worried about their balance sheets. Lax oversight by bank regulators has been replaced by close questioning. Bad loans are still not all recognized and new categories of potentially bad loans have opened up, e.g., the sovereign debt of the PIIGS countries, whose debts are freezing bank liquidity despite of banks EU rescue programs. Speeding up implementation of Dodd-Frank financial reforms would improve confidence in and among U.S. banks. 3. Pass the President's Second Jobs Program. Another $450 billion for job creation may not be sufficient. However, it is necessary and a CNN poll and others show, by wide margin, that the U.S. public wants this program implemented. 4. Encourage Entrepreneurship. Creating jobs is not just about getting existing firms to hire more workers. It's about encouraging people to start up new businesses. Incubators help. Entrepreneurship can be taught - it's like a language. Governments at all levels can do big and small things to make it easier for people to create businesses. 5. Modify Fuel Prices to Encourage Green Jobs. Federal subsidies of alternative energy and energy efficiency didn't work as well as hoped because prices for fossil fuels don't reflect their full costs (and also because many states and localities did not have staff ready in 2009 to respond to stimulus programs offering money for green jobs). Subsidies for fossil fuels need to be ended and a tax on gasoline or carbon should be imposed. Tom Friedman had a good op-ed on this topic today ("Is It Weird Enough Yet?"). The last Congress rejected cap-and-trade and a carbon tax, but the pressure to find money to pay for Medicare and Social Security, as well as more evidence on global warming, might bring these proposals back to debate and action. 6. Most of All, Reform the Tax Code to Encourage Job Creation. If U.S. payroll tax rates are lowered significantly, as President Obama has suggested, this will have a dual benefit, encouraging employers to hire and putting money in the hands of middle-class consumers, who will spend it. This could be paid for by raising the top tax for those earning, say, $500,000 or more, and gradually raising the cap on the payroll tax (as Sen. Bernie Sanders, I-VT, has proposed). This would return the income tax to a semblance of progressivity and would tax those best able to bear the burden and least likely to spend new money. George Magnus in the Financial Times describes the world's predicament as a "once-in-a-generation crisis of capitalism", bequeathed by the excesses of the 1980s-2008 period. The stakes couldn't be higher. President Obama wants to cut payroll taxes and pay for it in part by raising the top Federal income tax rate. Cutting payroll taxes is long overdue. You get less of what you tax. If you tax jobs - and that's what a payroll tax is - you get fewer jobs. Also, a middle-class worker is more likely to spend the money from a tax cut than someone earning $500,000 a year. What would the effect be of a higher top Federal income tax rate? Tony Phillips in his blog on Salon.com compares top marginal tax rates and job growth during the period 1925-2010. Meanwhile, in the low-top-tax-rate years, inequality of income has increased. This has hurt consumer demand, which is the bulk of GDP. The payroll tax has become a huge share of Treasury income, but it tops out. Without a higher top rate, our income tax structure is highly regressive, as Warren Buffett has famously complained. [In 1980, when] America's top marginal income tax rate was 70%, that rate applied to earners with incomes of $215,400 or more. In 2011 dollars, that equals $590,000. Under a 1980 scheme, only a tiny fraction of Americans would pay the top marginal tax rate. So Obama's proposed tax reforms look good from both sides. Cutting payroll taxes will boost demand and create jobs. Raising the top income tax rate to pay for the cut reduces the severely regressive tax sttucture and seems historically to be associated with more job creation than occurs under the present low-top-rate system introduced during the Reagan administration. On December 18, 2008, I reported on a speech by Laurence Meyer of Macroeconomic Advisors in which he said that after the December 16 Federal Open Market Committee statement, the FOMC could go on vacation for two years. In other words, by going to the zero (actually 0-0.25 percent) interest rate policy, the Fed was out of ammunition in the battle for recovery from the financial meltdown. In other words, the United States was in the Japanese liquidity trap. Paul Krugman wrote an article in 1998 for Brookings with two other economists on the Japanese liquidity trap. In 1999 he posted his prescient thoughts about the possibility of a Japanese-style liquidity trap happening in the United States. He reviewed the assumptions of the traditional IS-LM model and concluded that at the zero-interest bound characteristic of the liquidity trap, the central bank has little power. In order to change expectations, he argues that inflation targeting is the solution - the central bank should plan on a certain degree of significant inflation. That will impose a negative interest rate on passive owners of liquid assets. It will force them to hunt for yield higher than the inflation rate and - assuming the banking system is working properly (which it was not doing in the first decade of this century) - that will prompt owners of liquid assets to invest. Krugman posted again on the liquidity trap in 2010 but with no mention of inflation targeting. Interestingly, the 12th edition of Baumol and Blinder, Economics: Principles and Policy (South-Western, 2012, 2011) does not include anything specific about the IS-LM model. (Co-author Alan Blinder was formerly Vice Chairman of the Federal Reserve Board.) The book does not include "zero-interest" or "zero bound" or "liquidity trap" in its index. But it does have a box on inflation targeting (p. 695), noting that the current Fed Chairman, Ben Bernanke, was a "big advocate" of inflation when he was a Princeton professor. The British Chancellor of the Exchequer sets an inflation target (currently 2 percent) and the Bank of England is required to work towards meeting that target. Stanford Professor John Taylor showed during the Chairmanship of Alan Greenspan that the Fed's decisions could be replicated with a simple guideline, the "Taylor Rule": (1) When the inflation rate is above 2 percent, raise the real interest rate proportionately above 2 percent. (2) When there is a recessionary gap, reduce the real interest rate below 2 percent proportionate to the recession. Baumol and Blinder note that "No central bank uses the Taylor rule as a mechanical rule." But it is a useful guide to what is actually going on.